The second half of the World Ski and Snowboard Festival is now upon us! Day 6 finally brought the rainy weather, but the fog up top couldn’t stop the die-hards from getting a solid day in on the mountain. The rain didn’t matter much anyways, since the biggest event of the day took place indoors. Intersection is the action-sports film competition that brings the rowdy ski bums out in droves. 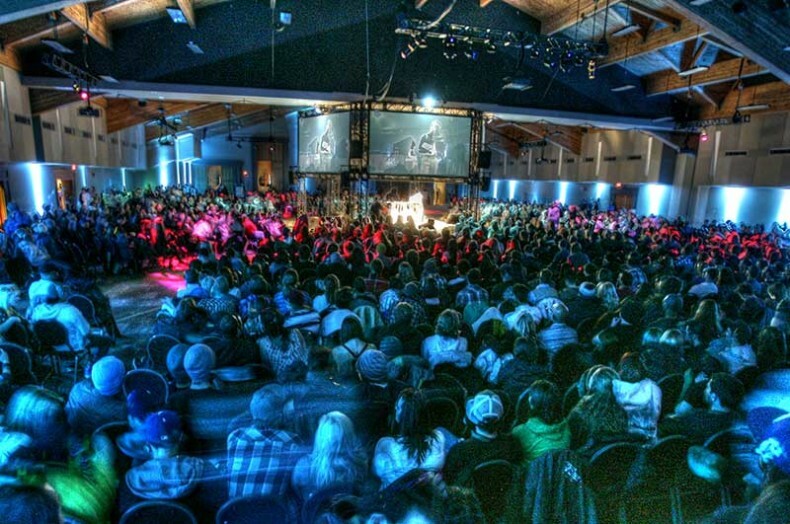 Six teams competed in the show: they had a week back in March to film a 5 to 7 minute ski and snowboard film within 100 kilometers of Whistler. The week of filming happened to coincide with some of the best snow we’ve seen all year, so you can imagine the caliber of the shows. A posse of legendary local snowboarders, “The Man Boys”, stole the hearts of both the judges AND the crowd, taking home the first place prize as well as the People’s Choice Awards. Their hilarious show was beautifully executed and captured the spirit of the characters on the team. Unfortunately, if you weren’t there in person, you won’t get to see the show: the Man Boys have vowed to keep it off the internet, old-school style. Tomorrow, we’ll be one step closer to the final weekend of the Festival, meaning the skiing Big Air and Slopestyle competitions are just around the corner. Get excited!